Games have always predicted the end of humanity. Zombie hordes, robots gaining sentience and taking over, nuclear winters, humanity self destructing, Earth getting hit with a meteorite, pandemics, you name it there’s a game predicting it. It seems that game studios know something we don’t and their service awards have exposed them – handing out shields, helmets, and even swords to dedicated employees. What better way for game studios to show its appreciation of your talents than equipping you with items for surviving the inevitable apocalypse – so kind of them. You might have to work several jobs simultaneously to get your hands on all of them but you’ll be kicking yourself when the worlds starts to fall into chaos happens and you don’t have your Frostmourne sword or Cyberpunk 2077 samurai jacket to keep you safe. Whatever end of the world event is coming, zombies, aliens, robots, monsters, we’ve got you covered. Here’s where you need to dedicate your career so you can survive the upcoming apocalypse. Blizzard is the perfect place to start, they have a number of dedication awards that are essential for surviving the apocalypse. After two years you get a tankard, which looks very nice but we’re prepping for the end of the world here so it’s the five years and higher awards that you should have your eye on. If you work at Blizzard for five years you get a sword, just a straight up deadly sword. The design changes each year so fingers crossed that you get something like Frostmourne from World of Warcraft. After 10 years you get a lovely shiny shield to match your sword. It’s difficult to tell how sturdy it is from Blizzard’s website but if it’s a nuclear winter situation it looks like it would make a great sledge. Continuing into 15 years, you receive a ring which I’m hoping possesses magical properties worth the fifteen year dedication. 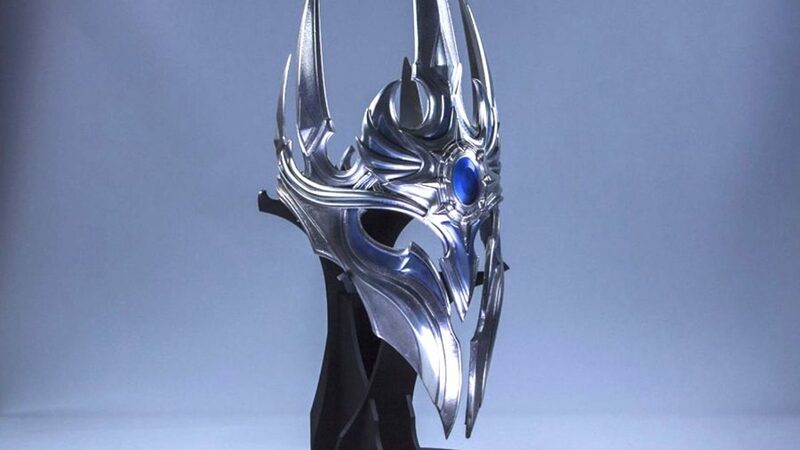 But, the ultimate reward after working for 20 years is a glistening, silver helm based on Diablo 3’s Archangel Imperius. Now that will protect your noggin from any apocalyptic nasties. Now is this is what I’m talking about, a custom made jacket by CD Projekt Red just screams punk apocalypse. Matseuz Tomaszkiewivz received this present from the Polish game company after working there as quest director for 10 years. The leather samurai jacket is from the studio’s upcoming game Cyberpunk 2077 and features a sharp tusked robot-demon on the back. Alongside the jacket Tomaszkiewivz also received a black briefcase that might work as a bludgeon in a pinch. But. the jacket looks sturdy and is a great start to your apocalyptic wardrobe. Think of all the street cred you’ll get. So, your preparation is coming along quite nicely, but you can never have too many weapons. Two swords are better than one. 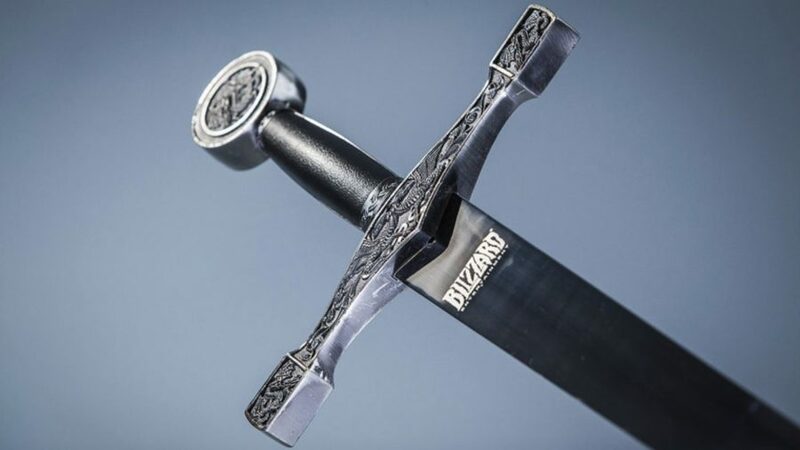 Blizzard’s five year service sword is good but does it compete with a genuine Viking sword? That’s what you receive after working at Eve Online developer CCP games for 10 years. Due to Icelandic law you’re not legally allowed to possess weapons, so when you are given your blade it has to stay on CCP’s epic sword wall – which you can see in its office tour video. But when the apocalypse starts and everyone starts panicking just grab yours off the wall, smash open the box, and you’re ready for battle. From the glimpse in the video – seen at 02:18 – the sword looks to be a typical Viking sword with a single-handed hilt, cross guard and made of iron. Very nice. Coupled with Blizzard’s sword, you’re now equipped for any alien invasion or robot take over that may arise and you can switch between the two swords like a post apocalyptic Geralt of Riviera. Reddit user MaxTurnbull showed off his dad’s present from Activision Blizzard after working there for 15 years. His award was six iconic game controllers engraved in silver and framed, displayed in all their glory. With Disney being a multi-billion corporation you would expect their service awards would help nicely towards your post-apocalyptic prep. Well, think again. After 60 years of service Oscar Martinez received a Cinderella statue, not exactly my weapon of choice. I know what you’re thinking. How can some silver engraved controllers help me in the brutal hellscape that will be the apocalypse? Well think about it, assuming that the economy will collapse and money becomes obsolete you’ll need something to trade with. Everyone wants a nice bit of silver. Also, what if it’s a vampire/werewolf apocalypse situation like in Castlevania? Melt it down to make silver bullets or a nice stake. If all else fails, then they also look quite heavy so you could chuck it at a beasty in hopes of doing some damage or join two of the controllers together and create a pair of awkward nunchucks – the apocalypse is the perfect time to get creative. The same smelting and trading plan can also apply to BioWare’s service awards trophies. 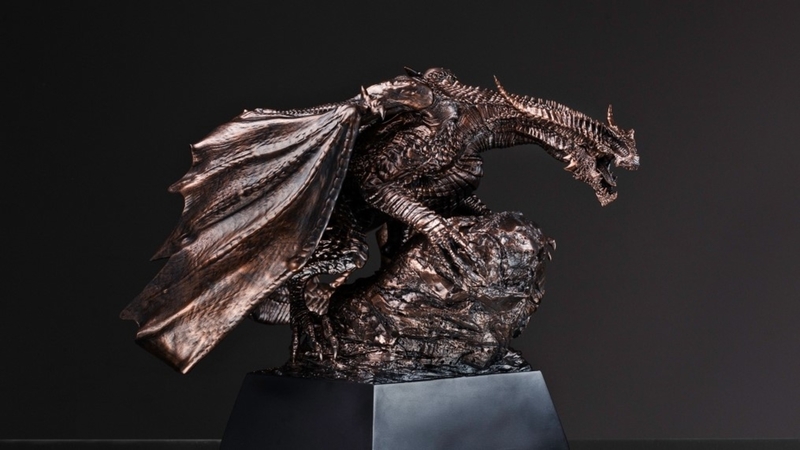 Starting at five years you get a statue of Dragon Age’s Varric Tethras, after 10 you get Mass Effects bounty hunter Wrex, at 15 years you get Commander Shepard (FemShep), and finally at 20 years you get a statue of the High Dragon. These statues would display so nicely on your desk, act as the perfect centerpiece to any display, or act as a subtle flex for onlookers at a party. But those times are gone and the party’s over so you better get on with melting those bad boys down. BioWare doesn’t state what the statues are made out of but describes them as “heavy” so the optimist in me says they’re bronze. After a quick scan on IForgeIron.com it seems that bronze can be difficult to smelt so if that fails then the trading/bludgeoning route might be better. If you’ve followed this guide then you should be equipped with a potentially magical ring, a flashy shield, one steel sword, one iron sword, a sturdy leather jacket, silver and bronze trading materials, and – to complete the look – a badass helm. You’ve worked at Blizzard for 20 years, Bioware for 20 years, Activision for 15 years, CCP Games for 10 years, and CD Projekt Red for 10 years. That’s a grand total of 75 years of consecutive work, congratulations! You can finally retire and rest easy knowing that you are now ready for the inevitable apocalypse.